Many scientists are interested in developing supercapacitors, which have electrolyte rather than solid dielectric between the charged plates. In the field of electrochemistry, cyclic voltammetry (CV) is often used to determine the capacitance of electrodes (e.g., carbon-based electrodes) in supercapacitors. 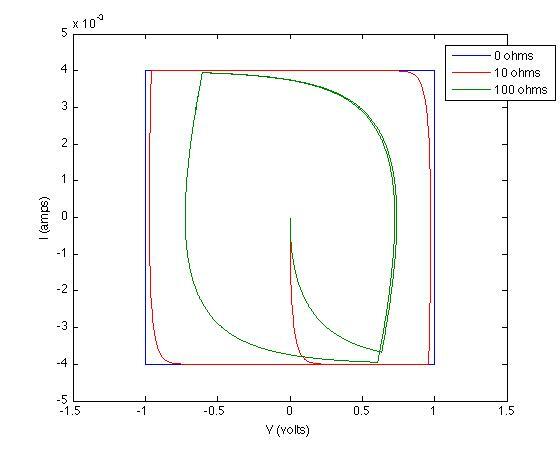 I have often heard that an ideal capacitor gives rise to a rectangular cyclic voltammogram (CV). Can you please help me understand why this is the case? In other words, why does an ideal capacitor reach a constant current I as soon as a voltage V is applied? I indeed see nearly ideal CVs in many literature articles (CVs which are rather rectangular with rounded corners). In other figures, though, I see relative deviation from "rectangles with rounded corners," in that I see abrupt peaks, spikes, or valleys. For example, below I have plotted two figures from Khomenko, Electrochimica Acta 2005, 50, 2499-2506. Just very roughly and "hand wavy," what might be the qualitative reason for the "rectangle with rounded corners" behavior of Figure 8 (left) and the "abrupt peaks" behavior of Figure 4 (right)? Could it be that the sample in Figure 8 (left) is relatively unreactive toward apllied potential, whereas the sample in Figure 4 (right) undergoes redox (Faradaic) reactions -- indicating the presence of so-called pseudocapacitance -- when an external potential is applied? Please know that I am not looking for an answer specific to the article to which I linked. I am only asking this question in the context of basic, qualitative aspects of cyclic voltammetry. Thanks! A ideal capacitor makes a rectangular "volt-ammogram" because that's how capacitors work. Look at the equation of current through a capacitor as a function of voltage and you should be able to see this. First, let's clarify what graph you are talking about especially since you are using a term not usual to electrical engineering. I've heard it before from electrochemistry folks, but it took me a while to realize what they were actually saying. You are slowly sweeping the voltage up from some start point to a end point, then slowly back down to the start point. The X axis is voltage and the Y axis is current. Since you are plotting volts versus amps, you mumble these two together into "voltammogram". If for example a resistor was being measured, then the rising-voltage part of the plot would be a straight line with current proportional to the voltage according to the resistance. As the voltage was swept back down to the original value, the plot would retrace the same line it went up. Not terribly exciting. Interesting stuff happens when electrochemical reactions are involved. For example, imagine a battery being tested as opposed to a resistor. The battery is being charged as the voltage increases, then discharged as the voltage decreases. It is not going to follow the same path forward as backward. In fact, the area inside the curve is a rough indication of electrochemical activity. Basically anything with "memory" is going to have a non-zero area inside the voltage low-high-low loop. Where A is current in Amperes, F capacitance in Farads, V electromotive force in Volts, and s time in seconds. So now you should be able to see that if the voltage is increased at a steady rate (V/s fixed), then there will be a constant current. On a voltammogram this means a horizontal line. Now when the voltage is decreased the same thing happens but the sign of the current is flipped. This is again a horizontal line but at some negative current (below 0 on the plot) whereas the first line was above zero. The current switches instantaneously from positive to negative as the voltage is changed from increasing to decreasing. The current suddenly changes but with little or no change in voltage, resulting in vertical lines. Put it all together and you have a box for an ideal capacitor. The kind of analysis truly required is outside the scope of chemistry and would be best handled in the careful hands of an electrical engineer. I'll give a brief attempt that exploits an easy-to-use circuit simulator. These results are due to setting up differential equations and solving them appropriately. You can play with the circuit I made for yourself here. Not the answer you're looking for? Browse other questions tagged capacitor voltage current-measurement capacitance electrolytic-capacitor or ask your own question. How can capacitance values be determined from a cyclic voltammogram? Does an ideal capacitor dissipate power? Why does the distance between the plates of a capacitor affect its capacitance? Why do we take rectangular plates in the capacitor? Why does capacitor voltage lag current? Why is the capacitor considered lossless, even if it can store/give out energy? Does an electrolytic capacitor have a minimum voltage? Why cyclic voltammetry requires three electrodes? exactly why does a capacitor build up charge when hooked up to a battery? 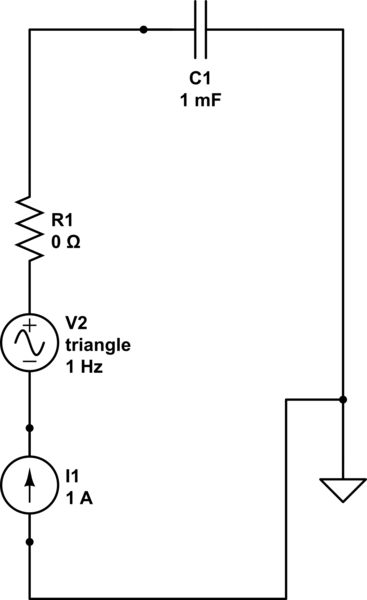 How does the current remains constant in an ideal capacitor?